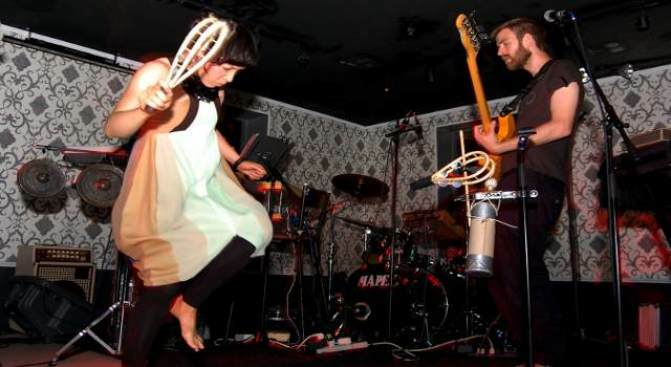 Despite Yukimi Nagano's best efforts, the instrument survived. What if What is it with Swedish music lately? Seems like ever since El Perro del Mar and then Lykki Li popped up on our radar, it's blowing up everywhere. But if you were anywhere except Liv on Sunday night, you've probably never heard of Swedish electronic/soul band Little Dragon. Based in Gothenberg, Sweden and signed to British label Peacefrog, the fact that Little Dragon can tour in North America with only two studio albums under their belt -- and limited radio airplay -- is a testament to their viral popularity. Well, that, and the sweaty mass of people who hung from every nook and cranny of Liv on Sunday night craning to get a glimpse of Little Dragon and Swedish-Japanese lead singer Yukimi Nagano (and yes, she's just as hot in person). Playing a mix of older material and songs from their upcoming album Nagano, the group seemed to feed off the energy of the at-capacity crowd as Nagano alternated between crooning soulful melodies into the mic and attempting to beat the living crap out of an unidentified percussion instrument.